TASCAM’s DR-07mkII improves on one of the best-selling portable recorders ever with adjustable microphones, clear sound quality and a great new design. The stereo recorder features a pair of adjustable condenser microphones. The built-in cardioid pattern mics can be moved from an XY position, for tight imaging, to an AB position, for a wider ambient sound. Choose the best sound depending on the source and environment. The sound of the DR-07mkII reflects over 30 years of TASCAM’s recording experience. A separate power supply for the codec enables the full capabilities of the A/D and D/A converter, and separate analog & digital circuit boards and low impedance circuit design reduce noise in the design. The DR-07mkII records to microSD or microSDHC media, recording in MP3 or WAV (BWF) file format at up to 96kHz/24-bit resolution. The 1/8” mic/line input allows you to plug in your own microphones and can supply plug-in power for mics that need it. The Level Align function prevents uneven volume levels during playback through the 1/8” headphone output or built-in speaker. Variable-Speed Audition – which changes playback speed without affecting pitch – and looping are also available during playback for transcription or learning new music. 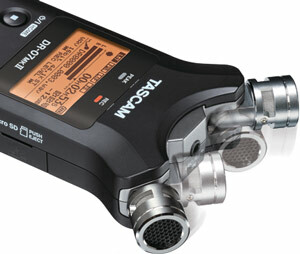 17.5 hours of longer battery life at 44.1kHz/16-bit, WAV (BWF) is long enough for any recording situation. Sharing some features with the new DR-05, the DR-07mkII makes recording simple enough for any musician. The Peak reduction function sets the optimum recording level even in recording to avoid the over level. Quick Menu selects commonly used parameters in playback or record like auto level setting or limiting, while deeper settings are available through a full-featured setup menu. Some DR-07mkII features that aren’t found on the DR-05 include Overdub mode, which records over your previous take but keeps a copy of the original. The portable recorder also includes Auto Record and Auto Mark settings for hands-off operation. A reverb effect is also provided to give your recordings that mastered polish. Getting great-quality stereo recordings has never been easier than TASCAM’s DR-07mkII.